Seems the last time I looked we were getting ready to launch “These Are The Days” on the first day of summer back in June. Well, I guess the calendar doesn’t lie but it sure does like to be cagey. Right now it’s 90 degrees and I’m wearing shorts and a tee shirt. But that’s the way it goes. We have some great shows coming up this weekend that I want to talk about right off the bat. First up is Easthampton on Friday, September 7. The place is Luthier’s Co-op on Cottage St (one of the best places to see music anywhere). The night kicks off with the pop music of The Prestons at 7pm. The duo of Bill Catalde and Rick Murnane perform as Liam and Chard Preston and who—according to their Bandcamp page bio “write cheerful songs about death and dead people . . . and on rare occasions come out and sing them to the living”. Colorway goes on at 8pm and we’ll play a 90 minute set of tunes spanning all three albums and maybe even throw in a Tom Petty cover if the time is right. Closing out the night with a set beginning at 9:30 is Sly Fox and The Hustlers, a trio from Albany, NY who play “Heavy voodoo blues over swampy, funky, grooves”. Saturday. September 8 sees us back in the comfy surroundings of TOAD Cambridge right in the heart of Porter Square. This has quickly become our go-to place to play in the Boston area. This 21+ show is a no cover affair and we go on nice and early (7:30) and will play until 9:15pm. They have great food, too! 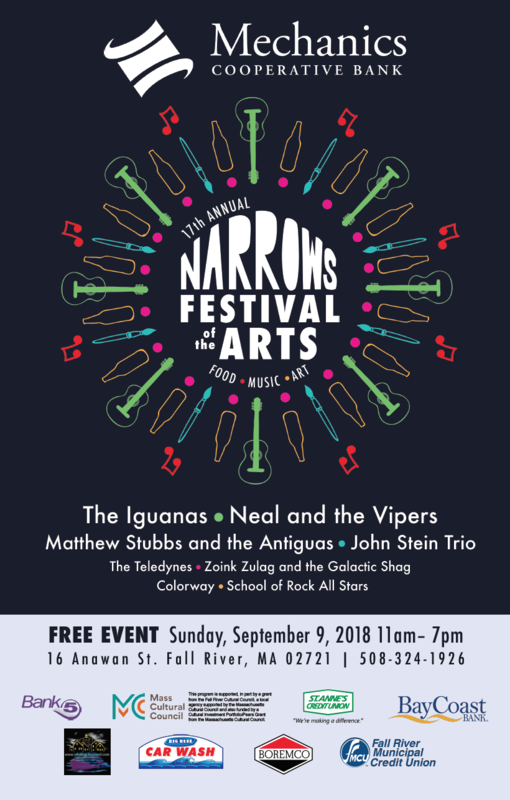 Sunday, September 9 we are thrilled to be part of the Narrows Music and Arts Fest in Fall River, Mass. This is my hometown and I’ve played the amazing venue (The Narrows Center For The Arts) before both with Drunk Stuntmen, the original Colorway lineup as well as opening shows, solo, for Ian Hunter as well as Quinn Sullivan. But this is the first time the trio of me, Riley and Matt will be performing onstage. It’s a full day and early evening of music on two stages. Colorway will play indoors from 1:10-2:10. Scroll down for the full lineup and more info. Looking ahead to Friday, September 14 we will head back to Troy, NY to play at Dinosaur BBQ. This will be a full-on three hour show beginning at 9pm. It’s absolutely free and the barbecue–as Matt would say–is bananas. So, if you’ve made it this far I might as well share some more stuff with you. We had a great album release party at New City Brewery. Tom Adams from Reelife Productions took some great videos of us (with sound from Bob Humphreys). You can check one of the tunes “Want To Be Everywhere” out right here. We have other vids on our Youtube channel. Be sure to subscribe while you’re there so you don’t miss out on fresh new vids. You can pick up the new album at any of our live shows as well as via our webshop and Bandcamp. We’re also on iTunes and all the other streaming services that they talk about in the news. Reviews have been all positive. The Valley Advocate’s Chris Goudreau said “‘These Are The Days’ will give you hope for humanity”. You can read lots more reviews right here. It makes us all so happy to know our hard work has made even a bit of difference. We were so lucky to have Easy Weasel as part of our album release. Thanks to Chris Collingwood, Rick Murnane and Brad Thayer for putting on such a harmonious set. There are also some amazing photos from that night taken by Julian Parker-Burns as well as our set at Transperformance 28 where we performed as Tom Petty & The Heartbreakers. You can check those out here and see the full Tom Petty set here. I’ve been playing a lot of solo shows lately. And to go along with this I was blessed with a great session of portrait photography by the incredible Jim Gipe at Pivot Media right here in Florence, Mass. You can see some of the pics here. I’m a lucky guy and am happy to be able to find a place for this music all by my lonesome. I’ve been putting up some small snippets (60 seconds or less) of my guitar playing on our Instagram page. If you haven’t checked us out there why not head over and follow us. There’s been a lot that’s happened this summer. So many great shows and so much amazing music. We love it that you are on board with what we do but we can’t do this all ourselves. So if you like what you hear and see please share us with a friend who might not know who we are. Forward this to somebody in Boston or Troy or Fall River who digs the rock and roll. We’re all in this together. Let’s have some fun! COLORWAY, and SCHOOL OF ROCK ALL STARS. 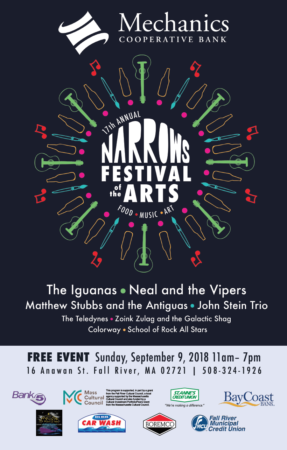 The Narrows Festival of the Arts has emerged as one of the premier music and arts festivals in New England. Ideally located on Fall River’s historic waterfront, the free festival features a wide variety of high-quality art and music. Musicians will be rotating through all day long on both an outdoor and our indoor stage. There will be twenty art vendors present, sharing and selling their original work. Food trucks and lemonade will be onsite, as well as exotic animals as part of the Children’s Museum tent. Come on down for a fun day of music and art! Excited to be heading back West to Troy to perform at one of the best live music venues in the area: Dinosaur BBQ. Well, it’s been a long time coming (three years, in fact) since our last album came out. But the day has finally come for These Are The Days to be released and we are just so overjoyed about it all. As of this morning you can buy a download of the new album on our Bandcamp page. If downloads aren’t your thing and you’d rather have the physical CD then head over to our webstore where you’ll receive a brand spanking, new, round, vinyl Colorway sticker with each and every purchase! While we know lots of people just stream music these days (including myself) you have the option to listen to our music on Pandora, Amazon, Spotify, iTunes and lots of other streaming sites. We’d love it if you did listen to us that way to maybe share us with a friend, tell a co-worker or just yell out your car window “Colorway rocks!” That would be so cool. We put a ton of work into this album and we hope you hear it when you play it. Myself, Matt, Riley, Danny Bernini and Chris Collingwood went all out to make this something special and I couldn’t be more proud. Even Jodi, my wife, provided the new background artwork you see above and is in the inside of the album and on our website. And the estimable Julian Parker-Burns provided our new (and now ubiquitous) band photo. Tom Pappalardo did a great job with the layout as per usual. It takes a village, they say. And this village dweller thanks everyone who came together to help make it happen. The lyrics are up on the website and for those of you who buy the download but would like the credits and liner notes and all the extra artwork head over to the These Are The Days EPK. You can read a fantastic review of the new album here by Eric R Danton who has written for Paste, Pitchfork, The Wall Street Journal and Rolling Stone. There’s a list of local music stores at the end of this email as well where you can pick up the new album in person. It’ll be $10 no matter where you go and that’s what we’re charging at the shows. We think it’s worth it and hope you do too. We will be celebrating the release tonight at New City Brewery in Easthampton, Mass. It’s located right behind the Eastworks building at 180 Pleasant St (directions here). There should be plenty of free parking for your convenience. If you’d like to purchase advance tickets head over to Laudable Productions. We’re hoping there will be tickets left at the door but you never know. Tickets are $12 either online or in person. The show starts promptly at 7:30 with an amazing new supergroup: Easy Weasel. This trio features none other than Chris Collingwood (from Fountains of Wayne/Look Park) as well as Rick Murnane (Group Deville/The Prestons) and The Glad Machine’s Brad Thayer. They promise to bring you a set of “throat rock” and kick it with guitars, keys and mucho vocals. It should prove be an amazing confluence of talented dudes, indeed. Colorway will go on shortly after that (around 8:15) play a chunk of tunes from our first two albums followed by the new album in its entirety. We’re aware it’s a school night so we’re gonna try and keep things from going past 10pm. But if it gets rowdy we are gonna have to flow. There will be creative southeast Asian food available from Little Trúc and New City Brewery will have their famous ginger beer (both alcoholic and non) as well as plenty of other options for your drinking pleasure. And just so you know, this show is all ages. That is so damn cool that I wish I was 17 again. We hope you can be there and we’ll be so happy to see you if you can make it. Thanks, as always, for your support of what we do. We’re gonna be on the TV! Also today (Thursday) tune in at 11am EST to WWLP-22 (channel 822 on Xfinity) to watch the band play “Always Been Summer” on Mass Appeal. 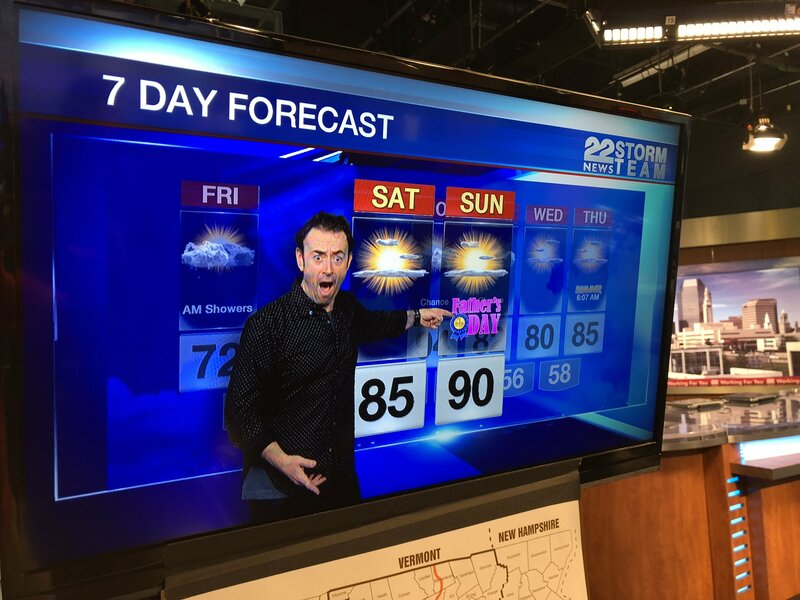 And I took part in the Father’s Day forecast. Let’s call it my fifteen seconds of fame. 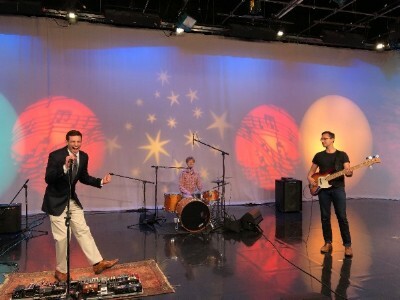 Anyway, if you want to catch the band performing tune in or set your DVR to record WWLP Channel 822 from 11-noon EST. We also recorded “Come Back July” and “Keys To The Kingdom” which will be shown on another date. I’ll be sure to keep you posted on that via our Facebook, Instagram and Twitter pages. And that about does it, gang. Really, really excited to share the new album with you. I’ll include some quick quotes from recent reviews at the end of this. Hope to see you tonight for the big show. If you can’t make it but felt like sharing this email or even just the event on your FB or Twitter page that would be aces. Rock on and believe in the power of music. Sometimes, in this crazy world, it’s the only thing that makes sense.